Photo measuring 3.5 x 5.5 inches. 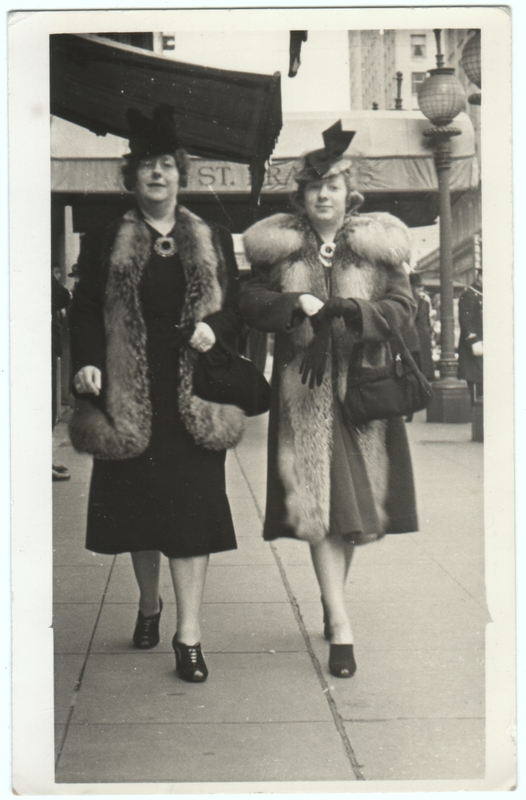 Although I say I know “Nothing!” about the photo in terms of its source and who these people are, I’m virtually certain we are looking at two ladies strolling in front of the famous St. Francis Hotel in San Francisco, California. The awnings have changed, but the street lamps are the same. If I’m correct, they would be walking down Powell Street, almost at Geary. I have at least one other photo (of poor quality) that I believe to be these same ladies strolling along a different street in different clothes, making me wonder just how candid these photos are. I’m guessing at the very least they were known to the photographer. Regardless, I enjoy this image, and it’s fun to find a photo that was taken a ten minute walk from my apartment. I’m guessing they’d love it or hate it. But either way, they wouldn’t be ambivalent. Mother and daughter? They do look rather proper. Good point. I had just assumed they were friends, but perhaps they are related. The one on the right seems to be putting on her gloves. Did they just leave the hotel? Are they staying there? I think the daughter would like Victoria Secrets 😉 Her coat is much flashier than her mother’s (they do look alike) and at the right angle she has a bit of a playfulness in her eyes. I believe that is the Sir Francis Drake hotel, above the canopy and to the right. The more I look at them, the more I see mother/daughter. I don’t know why it didn’t occur to me before. And if I’m correct in where this photo was taken, then yes, that would be the Sir Francis Drake peeking over the awning in the upper right. Helen Hokinson would love these ladies. The St. Francis still launders its change, a practice begun to protect the white gloves of their lady clients. I agree with all the conjectures that these are mother and daughter. I’m quite taken with how many details are the same: the hat bow, the pin at their collars, the furs, handbag shape, the peep-toe shoes. Seem as though there are more details than would coincide on a casual photo of a mother and daughter on their way to or from an event. Yes, I totally see it now that it’s been pointed out to me. Even the shape of their faces and tilt of their heads are the same.